The Australian Grand Prix always has a lot to live up to, kicking off the new season with so much anticipation placed on it for a good and chaotic afternoon's running. This year delivered, perhaps not so much in terms of drivers getting to grips with their new machinery, but certainly in terms of who was fast and who needs to work harder on their reliability. Featuring seven retirements, a new but familiar face on the top step of the podium, a handful of tasty radio messages and plenty for us to consider between now and the next event, the Australian race had it all. Relive the action with lap by lap coverage from the Factbyte Factbox below. Sebastian Vettel wins the Australian Grand Prix, his first since Singapore 2015. Bottas pushes Hamilton to the finish but ends third for double Mercedes podium. Ericsson and Magnussen come together on the first lap and both retire later. Romain Grosjean suffers engine failure and Haas fail to get either car to finish. 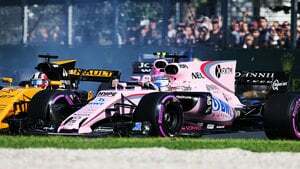 Esteban Ocon picks up first point in Formula One with tenth place. Hi friends, welcome back! 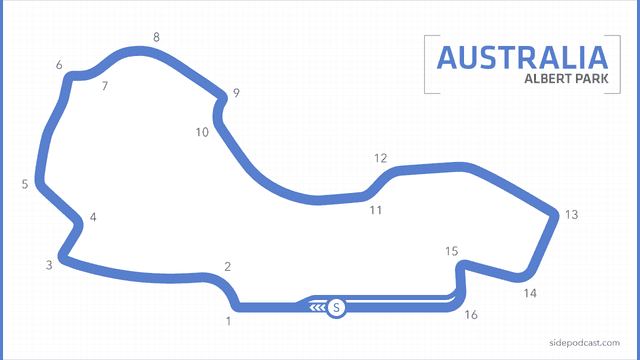 It's the first race of a brand new season, it's Australia, it's brilliant! A lot has been happening already, and we're only a handful of days into the new season. The big news updates start with the Sauber, who had to replace Pascal Wehrlein with Antonio Giovinazzi after Pascal realised he wasn't ready to complete a full race distance yet. A handful of crashes yesterday resulted in gearbox penalties today, with Lance Stroll having an incident in FP3, and Daniel Ricciardo crashing in the final qualifying session. Ricciardo has also stopped out on track on his way to the grid, with what sounds like a gearbox failure. The Australian has climbed out of the car for a disappointing start to his season. Jolyon Palmer, who finished last in qualifying and blamed the car for being pretty rubbish all round, is feeling better today: "It’s been such a hard weekend. I’m positive actually, we’ve got nothing to lose, we can have a crack forward. It’s the first race, anything can happen." Up front, Lewis Hamilton snatched pole position yesterday, with Sebastian Vettel on the front row, and their teammates taking up the second row of the grid. New fat tyres are available this weekend, with Pirelli providing all the drivers with the same number of sets heading into the weekend. Esteban Ocon of Force India: "I think the new start procedure is quite interesting and you’re going to see a lot of difference." Mechanics are having a good look at the rear of Daniil Kvyat's Toro Rosso, it looks like an extinguisher may be going off unexpectedly. National anthem time as the drivers make their way to the front of the grid for a moment of respect. Tweet from @McLarenF1: Umbrellas out. Not for the rain, but to keep the cockpits cool in the Australian heat. Romain Grosjean, starting from Haas's best ever qualifying position of sixth: "We’ll try to give our best as we did yesterday. It’s the first race of the season, a lot can happen. We start in a good position, hopefully we can get a good result. It’s going back to school, but it should come back pretty quickly." Tweet from @pirellisport: Just over five minutes to go. The start will be particular crucial: the clutch is much more manual than before. So an opportunity for some. Conditions look really good for racing today, blue and sunny skies over the gorgeous greenery of Albert Park. Rookie racers making their debut today include Lance Stroll and Antonio Giovinazzi, whilst Esteban Ocon and Stoffel Vandoorne kick off their first full season in Formula One. Mechanics whip off they mahoosive tyre blankets and clear the grid to let the formation lap get underway. The top 13 drivers are all on ultrasoft (purple) tyres, with Ericsson and Stroll on the supersofts, and Giovinazzi, Magnussen and Palmer on the softs. There's still a lot of frantic action going on in Ricciardo's pit garage, will he be ready in time? Start aborted - extra formation lap. This extra lap counts towards the full total. Looks like someone pulled into Ricciardo's spare space on the grid, so gained a bit of an advantage there. Good start for Hamilton and Bottas, but Vettel retains second into the first corner. Clean start for all, it looks like, but some dust kicked up at turn one towards the back of the field. A Sauber and Haas are tipped into a spin at turn three. Sergio Pérez makes an inside cut on Daniil Kvyat and takes the position to move into ninth. Kevin Magnussen has a puncture after that trip into the gravel, he's called into the pit lane. Turn 3 incident involving Magnussen and Ericsson noted. Red Bull have done an incredible job and Daniel Ricciardo heads out of the garage and takes to the track! Tweet from @MercedesAMGF1: Phew!! It's close up front. Lewis and Seb are running nose to tail, just 0.7s in it! This prancing horse has got legs!! Turn 3 incident involving Magnussen and Ericsson under investigation. Lewis Hamilton has complained over the radio twice now about a lack of grip - firstly he was concerned about getting away from the grid, now he's bemoaning his tyres after just five laps. Team radio from Marcus Ericsson: "Something is not right on the rear." "Yes, you've lost downforce on the rear." Jolyon Palmer got a good start, improving from the last row on the grid to run 14th. He's got a harder compound tyre on, too, so can go longer into the race than those in front of him. What of the beleaguered McLarens? Alonso is actually running 11th, just outside of the points. Vandoorne in 15th. Verstappen complains of oversteer AND understeer, but reckons it's just because he's running so close to Kimi Räikkönen at the moment. Vandoorne is warned not to get involved in a battle with Ricciardo, as the Red Bull driver is a lap down, but oof, moments later, Ricciardo sweeps past. "Have fun," the Australian's engineer says. 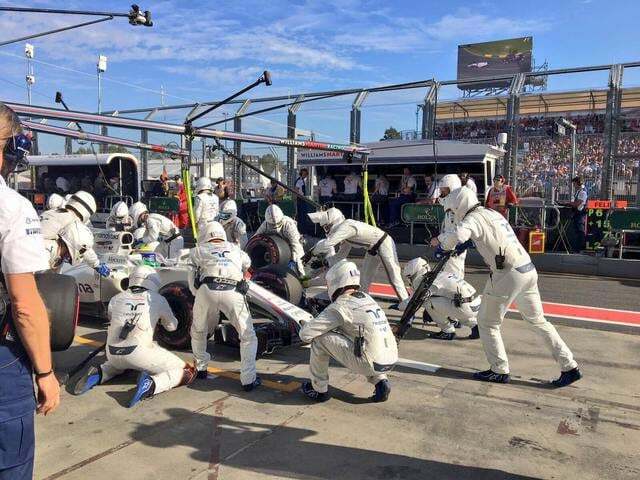 Lance Stroll is running down in 18th place, having taken an extra pit stop due to a flat-spotted tyre. Teammate Felipe Massa is way up in sixth, having snatched a position from Grosjean at the start. Stoffel Vandoorne comes in for a pit stop, and it's a long one as he reboots following complaining about a loss of power. He gets going again. Jolyon Palmer is running slowly, complaining of a brake issue. Turn 3 incident involving Magnussen and Ericsson - no action warranted. Palmer is back on the radio saying he has the same problem. Engineers are looking into it. Romain Grosjean has pitted with blue smoke issuing from the rear of the Haas car. The Haas team are quickly in with the extinguishers, and Grosjean hops out of the car. That retirement promotes Alonso up into the top ten, so McLaren are currently sitting in the points - not exactly exciting but not something they would have predicted a couple of weeks ago! Yellow flags as Jolyon Palmer runs slowly yet again - it seems to be happening only at one corner. It clears quickly. "If you can keep going, let's keep going if you can please," he's told. Poor Grosjean looks hot and bothered in the garage, looking on as the mechanics tend to the broken Haas. Lewis Hamilton dives into the pit lane for the first time this season. Soft tyre going on that Mercedes, a superb stop from the crew, and Hamilton is off on his way again. He rejoins in fifth place. Palmer has come into the pit lane, and is expected to retire. He complained of a loss of power, and yep, that's game over for the Renault driver. Plenty more pit stops being taken throughout the field, leaving just the front runners to come on. Marcus Ericsson down in 14th and Daniel Ricciardo in 18th also yet to come in. Pérez muscles his way past Carlos Sainz, moving that pink car up into eighth place. It looked more dramatic than it was, as Sainz locked up into the corner once the Force India had passed. Team radio to Lewis Hamilton: "We need to get past Verstappen, you are still safe to Vettel." "I don't know how you expect me to do that right now." Ferrari leave Vettel out once again. Let's not forget Ferrari have not had the ability to make good race strategy decisions of late. Vettel pits this time round, the red car pulls into his stop, a quick stop from the Ferrari crew and Sebastian moves into the lead! Verstappen pulls alongside the Ferrari but isn't close enough to make any difference. Yellow flags. Marcus Ericsson has stopped his Sauber at the side of the track. Hamilton complaining "There's nothing left in these tyres," which is weird because he only just put them on. Bottas comes into the pit lane, and Verstappen follows him in to free up Hamilton from the dirty air that's bothering him so much. Supersoft tyres go on that Red Bull but it's a slightly slower stop than his rivals. Kimi Räikkönen is promoted into the lead of the race, but he pits and hands the rightful lead to his teammate. Hamilton is informed they are now looking to switch to plan B, whatever that may be. Replays show Stoffel Vandoorne running a little wide and kicking up some dust in the McLaren. Yellow flags. Daniel Ricciardo has stopped in the first sector. Fans are epically disappointed as the Red Bull sits there gently smoking. Ricciardo in no hurry to exit the car. Team radio to Daniel Ricciardo: "Sorry mate, car's done." Ricciardo got out of the car and headed towards the marshalls, who then directed him to get back in the car and help steer it out the way. Couple of drivers stopping for the second time of the afternoon, including Nico Hülkenberg and Lance Stroll, both of him are now running on the ultrasofts. Tweet from @ForceIndiaF1: Esteban studying the rear wing of ALO. Overtaking the Spaniard would promote our young gun into the points! Daniil Kvyat still hasn't stopped so far this afternoon, running 35 laps so far on his first set of ultrasoft tyres. In he comes now, Kvyat in the Red Bull taking his first stop of the afternoon. Team radio from Fernando Alonso, on spotting the stricken Daniel Ricciardo: "Did we gain a place?" Ack, you can feel the disappointment. Bottas is closing in on Lewis Hamilton, as Vettel holds steady out in front. Shots of Daniel Ricciardo walking slowly through the paddock, helmet still on, which is unusual for the normally smiley Aussie. Really frustrating start to the year for him. Bottas is slashing the gap to his teammate, the question on everyone's lips now is whether Mercedes will intervene in the battle that is rapidly approaching. Ricciardo in the garage now, helmet off, chatting with the mechanics. He's not happy but equally not visibly fuming. Kimi Räikkönen is being given the hurry up, because with Hamilton's complaints about his tyres, they're sniffing a double podium in the works. Bottas is still closing the gap, but the laps are flying away very quickly. Just 15 left to go. Stroll, Vandoorne and Magnussen have all dropped two laps behind the leaders. Only the top nine are on the lead lap. Team radio to and from Carlos Sainz: "Okay Carlos, swap position now." "It’s a little bit early?" "Do this, Vettel is coming behind, we have blue flag, I will explain later." "He will give me the position back if he doesn’t pass Pérez, right?" "Okay, I’ll let him by then." Meanwhile, Lance Stroll was spotted running off track and now the Williams has headed into the garage and it looks like it might be the end of his afternoon. Sainz has let Kvyat through, the Russian moving up to eighth place. As he was on his way into the garage, Stroll reported: "I think I had a brake failure, I think something broke." Kvyat is working on passing Pérez, as per the terms and conditions of his teammate position swap, but is 1.7 seconds adrift at the moment. Giovinazzi desperately trying to get out of the way as the race leaders sweep past to push him two laps down. The Sauber driver is having a solid first race. Yellow flags as Kevin Magnussen pulls off track - that's a double DNF for the Haas team, and Grosjean watches on glumly from the pit lane. Daniil Kvyat, who ran so long into the race, has had to stop again, which has ruined the team's plan for him to chase Pérez. Tweet from @pirellisport: . @kvyatofficial comes into pits and changes tyres: stop was for a technical reason, and tyres were changed at same time. Magnussen reported suspension failure as his Haas came to a halt. Alonso just had the worst corner ever, with both Esteban Ocon in his pink Force India and Nico Hülkenberg in the bright yellow Renault dumping him out of the top ten. Ocon is flying away now, with Alonso left complaining there is something wrong with his car, "pulling to the left." Daniil Kvyat sets the fastest lap of the race so far, presumably refreshed with his new tyres. However, it lasts only a moment as race leader Sebastian Vettel goes even faster. 1:26.638. Fernando Alonso has pulled his ailing McLaren into the garage and is out of the car, retiring just four laps from the end. Six drivers only remain on the lead lap. Disappointingly, the challenge from Bottas has diminished somewhat. Making their way through traffic put a halt to the fight for a moment. Team radio to and from Daniil Kvyat: "Did I get the fastest lap or not?" "One tenth. Dany, bring it the flag. We have some points on the table. Just bring it to the flag." Team radio from Verstappen: "How much faster is the fastest lap?" Who knew the fastest lap was so important? Sebastian Vettel wins the Australian Grand Prix! Hamilton clings on to second, with Bottas rounding out the podium in third. Team radio from Valtteri Bottas: "Thanks guys. The reds were just too quick." Fans are streaming out onto track, which is bizarre because the cars are still going round on their cool down lap. Sebastian Vettel climbs from his car and celebrates with his crew in the parc ferme. Hamilton gives his rival a firm handshake as congratulations. Vettel has also been voted driver of the day for his efforts. Big smiles from the German driver on his first win since 2015. To the podium they go, and the national anthems play out. The trophies are handed out - constructors given to Ferrari by one Sir Jackie Stewart. Podium interviews - Sebastian Vettel: "It’s what we needed. The whole team has been working really hard. They didn’t get much sleep both here and back at the factory. The car is behaving well, incredible fun to drive. "For now, we’re over the moon. It’s been a hard winter. The start, I wasn’t entirely happy, I think I was too nervous. I had wheel slip off the line, but after that I was trying to keep the pressure on to make sure they get the message. We are here, we’re here to fight." Podium interviews - Lewis Hamilton: "Firstly, a big congratulations to Ferrari. It’s been a great weekend for us and the team, just in the race I struggled a lot with the tyres. I had to pit a lot earlier than these guys… overall a great race, good points for the team." Podium interviews - Valtteri Bottas: "First race with the team, really want to thank everyone. The team has been so welcoming, we’ve worked really hard to be ready for this first race. Everything went nice and smoothly, it’s just the red guys were a bit too quick, so we need to work harder. This is a start, on the podium, and we can improve it from here." A pretty good first race to kick off the year. Refreshing to see so many colours on the cars, and a change of colours on the podium! Mercedes still have the pace to dominate, but they could be challenged this year - Ferrari have got a better car beneath them and this win will give the team some fire. Disappointed that Red Bull couldn't put up more of a fight but it's early days. Clearly it was a bad start for McLaren with Fernando Alonso's constant issues on his car, but not as bad as Haas who suffered a double DNF. Great debut for Antonio Giovinazzi in the Sauber who caused no trouble and got his car to the end in 12th place. In fact, there was very little trouble at all, with the stewards only investigating one incident and even then deciding not to take any action. No safety cars and only the occasional yellow flag. The next race is in two weeks, taking place at the Shanghai International Circuit, and I will be back then to cover all the action!